One each Cyan, Magenta and Yellow Photodeveloper. Up to 28,000 pages per color. Actual number of pages will vary depending on individual customer usage. 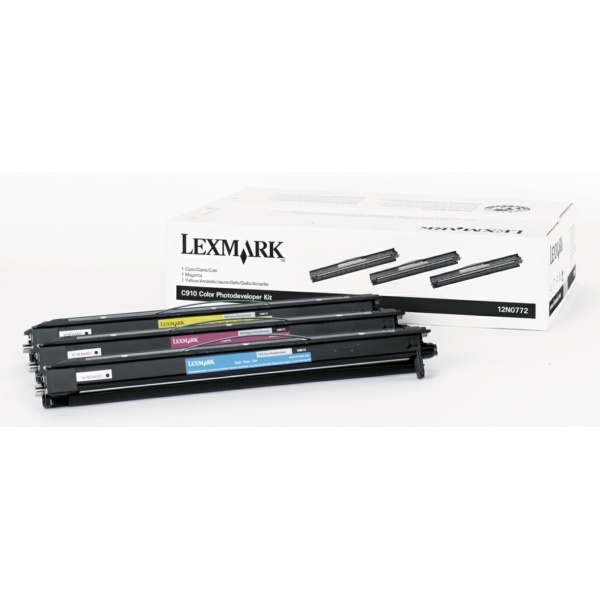 - For use in Lexmark C910, C910dn, C910fn, C910n, C912, C912dn, C912fn, C912n, C920, C920n, C920dn, C920dtn printers. - Papers & Transparencies have both been engineered for optimal use in the Lexmark C750 and C910. - Thanks to its brightness & whiteness, the Glossy Paper is perfect for customers printing their own brochures, catalogues and flyers, They will save money printing their deliverables on demand instead of keeping copies in inventory. Printable both sides. - The Color Laser Transparency is ideal for professional presentations. It is printable on either side for simplified loading.